Latham is the premier drain grating cover supplier, offering the Lathamgrate series of aluminium and brass grating covers that are all designed and manufactured in Australia. Latham’s grates and frames are consistently preferred to competing products fabricated from steel, cast iron or plastic, which do not offer the same level of durability or premium appearance as aluminium and brass. The Lathamgrate series consists of serrated top metal drain grates and frames that offer a practical and attractive solution to exterior and interior drainage and ventilation issues. The serrated texture provides a functional yet modern appearance that complements a variety of architectural designs. Lathamgrate trench grate, grid and frame systems are supplied in mill finish aluminium or brass. An anodised option is also available for the aluminium grating. We also offer alternative finishes such as patination or chroming on request. Most of the Lathamgrate range is available for trench widths up to 300mm wide as standard but Latham is also able to custom manufacture systems to varying widths. The grate, grid and frame systems are most commonly designed for pedestrian applications and as such comply with Class A of AS 3996-2006. Some grates can also be supplied for household and light duty commercial driveway traffic, and will comply with AS 3996-2006 Class B and C. The Lathamgrate series has been tested in accordance with AS/NZS 4586:2004 Slip Resistant Classification of New Pedestrian Surface Materials. Detailed information regarding these results can be found here. Latham’s floor grating bars are set 6.5mm wide and spaced at 13mm. 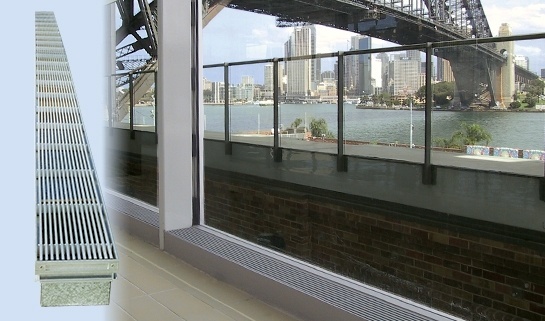 This has several advantages including: enhancing pedestrian safety by reducing the possibility of high heels being caught between the bars; reducing the amount of environmental debris (such as leaves and rubbish), which can fall into the drainage system; and limiting the risk of losing small dropped items such as keys beneath the grates. Latham’s drain grate covers offer exceptional flow rates for both air and water. This means they are suitable for both interior and exterior drainage or ventilation applications. Lathamgrate aluminium trench gratings and frames are an economical, functional and attractive solution to exterior and interior drainage and ventilation problems. 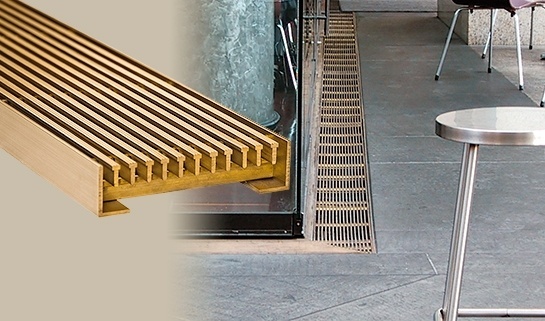 Lathamgrate solid brass trench gratings and frames are an economical, functional and attractive solution to exterior and interior drainage and ventilation problems.